We want this experience to be 100% about YOU and our goal is to give you the best treatment options (conservative or surgical) to improve your function, decrease your pain, and get you back to your pre-injury activity level. including the all inside minimally invasive ACL Reconstruction. He was also intricately involved with the medical management of all the university's athletes. Covering Hockey, Soccer, and LaCrosse games, Dr. Hansen worked closely with the Athletic Trainers to keep the athletes at the top of their game. Clinically, Dr. Hansen understands the importance of incorporating a multidisciplinary approach to treatment, and works with his patients to develop alternative exercise programs and utilizes innovative therapies to speed up the recovery process safely. Dr. Hansen specializes in the arthroscopic minimally invasive treatment of shoulder, knee, and ankle injuries, with the highest importance on protecting, repairing, and restoring the patients native cartilage. 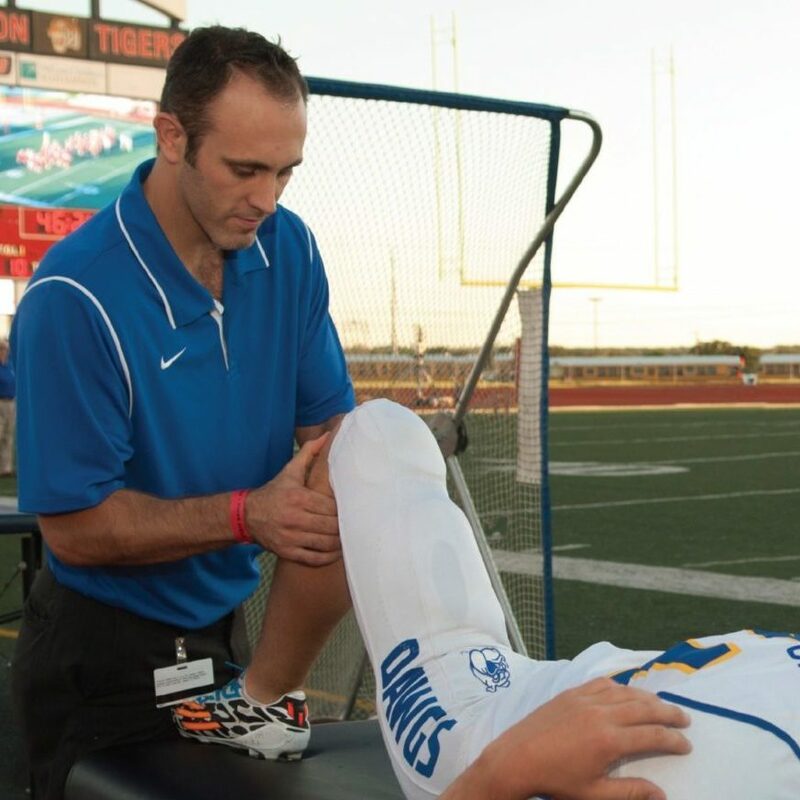 Dr. Hansen is a Texas native who has experience treating pediatric to Division 1 athletes and looks forward to continuing to keep Central Texas’ athletic and Orthopedic population at the top of their game. Dr. Hansen also utilizes the all-new Mako Robotic Arm. This state-of-the-art technology enables you to have a more predictable surgical experience when performing joint replacement surgery. The current Mako System offers Partial Knee, Total Hip and Total Knee applications. Dr. Hansen grew up in Carrollton, TX just outside of Dallas and his love of the Dallas Cowboys was nurtured at a very young age by his grandfather and former Cowboys Team Physician Dr. Ronald F. Garvey MD. As a student of Jesuit College Prep. high school in Dallas, Dr. Hansen was a perennial captain of the wrestling team and a starting pitcher for the varsity baseball team. After playing football, baseball and wrestling in high school, he focused on baseball, pitching for the Columbia University Lions in the Ivy League and in the Dallas Amateur Baseball Association after graduation. After enjoying the busy New York life, Dr Hansen returned to Texas for his medical education at University of Texas Southwestern Medical School. While in medical school, Dr Hansen coached a youth wrestling team in Dallas, and kept active by running triathlons with the North Texas branch of Team in Training. Dr. Hansen is married to Portia Hansen, pilates and yoga instructor, and they keep active together by running, biking, and chasing their 3 young children around. Please plan ahead before your visit to Dr. Hansen’s office for your initial visit. This will help make your experience as effective and efficient as possible. It is important that you bring with you all of the information needed (medical records, medication lists, previous surgery information, etc. ), so that we can gain the best understanding of your problem, determine the factors that may influence your treatment and formulate the best treatment plan for you. What time should you arrive for the Appointment? Please arrive 15 minutes before your first appointment so that you can fill out our office forms and questionnaires. X-ray, MRI, CT, & Arthrogram Films and Reports. If you have a CD please be sure to bring it with you. Dr. Hansen’s office hours are from 8:00 AM to 5:00 PM Monday through Friday. Please call for information, we take most major insurance carriers. Dr. Hansen is available for emergencies 24 hours a day, 7 days a week. If a medical emergency arises after business hours, please call our office. The answering service will page the doctor and he will return your call as quickly as possible. During and After your visit. It is very important for you to completely understand your injury and the treatment plan after your first visit. You are encouraged to ask questions throughout the process and to contact our office at any time. Review the material you were given in the office and the treatment plan. Make a list of questions that you did not ask during your visit. You may ask them at your next visit or call our office at any time. Follow the instructions (physical therapy protocol, post injection protocol, activity modification, etc.) given in the office. Take all medication as prescribed for the full course. If you have an adverse side effect from the medication, please call us and let us know so that we can change your medication. Take notes while you are at your appointment and ask questions. Ask for handouts that you can review at a later time or visit www.roberthansenmd.com to obtain more information about your condition. Our office will help you verify that the surgery is covered by your insurance policy before proceeding to booking the surgery. "Dr. Robert Hansen describes himself growing up as an “athlete” and “a science nerd.”"
"Whether you are a high school or college athlete, a regular at the gym, or someone who enjoys the occasional morning jog, you probably know that physical activity does the body wonders. But occasionally, it can also lead to injury." 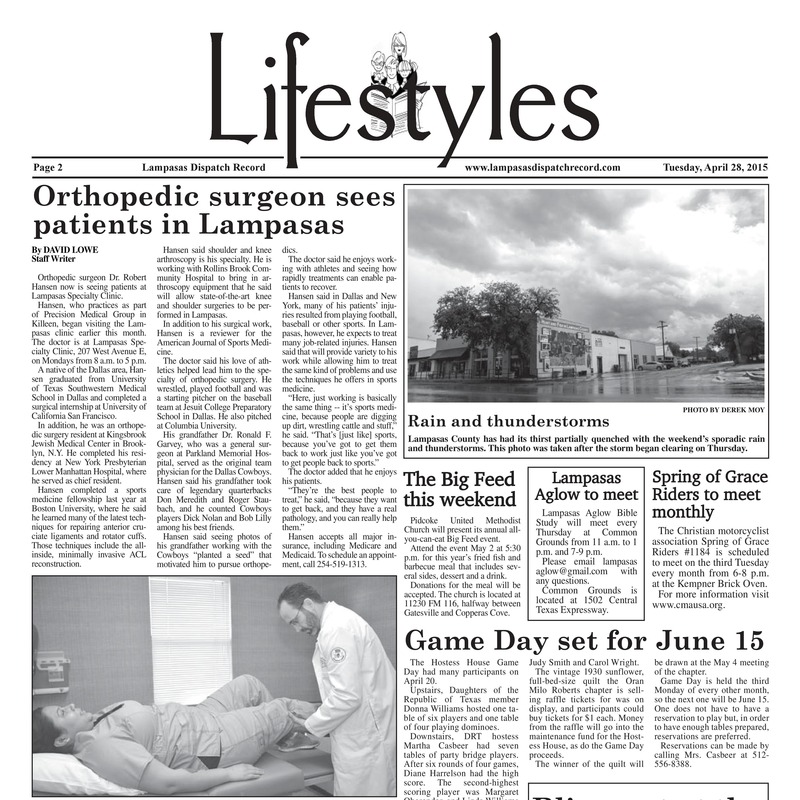 "The doctor said his love of athletics helped lead him to the specialty of orthopedic surgery. He wrestled, played football and was a starting pitcher on the baseball team at Jesuit College Preparatory School in Dallas. He also pitched at Columbia University." "Take steps to prepare body for rigors of a 5k run." Specializes in the arthroscopic minimally invasive treatment of shoulder, knee, and ankle injuries, with the highest importance on protecting, repairing, and restoring the patients native cartilage. Dr Hansen did an injection in my thumb. I was unable to even move it prior to the injection, and now it works just like it's suppose to. Thank you. Dr. Hansen recently operated on my wife and has been excellent from the day we met him. Very down to earth and takes the time to clearly explain the procedure and the recovery process. Always available to answer questions or concerns. Will highly recommend to anyone needing this type of surgery. We hope he stays in the Killeen area for a very long time. Thank you Dr Hansen. Dr. Hansen performed shoulder arthroscopy surgery on my 13 year old daughter. He did a wonderful job. My daughter was thrilled that the scarring is minimal, and that after physical therapy she'll be able to participate in sports. Dr. Hansen was professional and explained everything in detail. I'd definitely recommend him to anyone needing these types of surgeries. Best Dr. Ever! Broken ankle—Was afraid I'd never function normally again. Only a month later I am so happy with my recovery. Not only did Dr. Hansen patch me back together again but he and his whole team have always cared for me and my husband like I feel they would care for their own family members. Glad I ended up in his office! The office staff was exceedingly friendly, helpful and intelligent. Dr Hansen was informative and explained in detail what I needed to do to obtain the surgery I require. I enjoyed my time in the office and was treated like an ONLY patient, I would recommend Dr. Hansen to everyone. What impressed us the most was how he explained what he did in the surgery by using pictures he took of before and after. He sat with us and gave us the knowledge to be comfortable with the surgery and for after surgery care. Superior doctor that sincerely cares about his patients and gives you the time you need when you need it. His beside manners are great and he is extremely caring from diagnosis until the last day you see him. Recommending to all my friends and family in a heartbeat! Contact Dr. Hansen today by calling the number below or filling in this form.